Martin Renters was involved with the development of the DataFax Clinical Trials Data Management Software for 19 years as Software Developer, Chief Technology Officer and Director of Software Development. He understands how the software functions in depth and is available to assist you and your organization with edit check and custom report development. He has developed a toolkit of programs that convert QCs to Excel format, create annotated CRFs, create closeout PDFs and track electronic signatures as a few examples. The QC2Excel program converts the DataFax QC database to Excel format. The resulting output can be emailed to sites as an alternative to traditional QC reports or analyzed using Excel’s Pivot Table and other analysis tools. QC2Excel has options for simplifying its output for site use and can group the various unresolved and resolved QC statuses into Outstanding and Resolved states. In addition, QC2Excel has functionality to map center numbers to countries and regions as well as the ability to prioritize and color code outstanding QCs to draw attention to those fields that need most immediate attention. 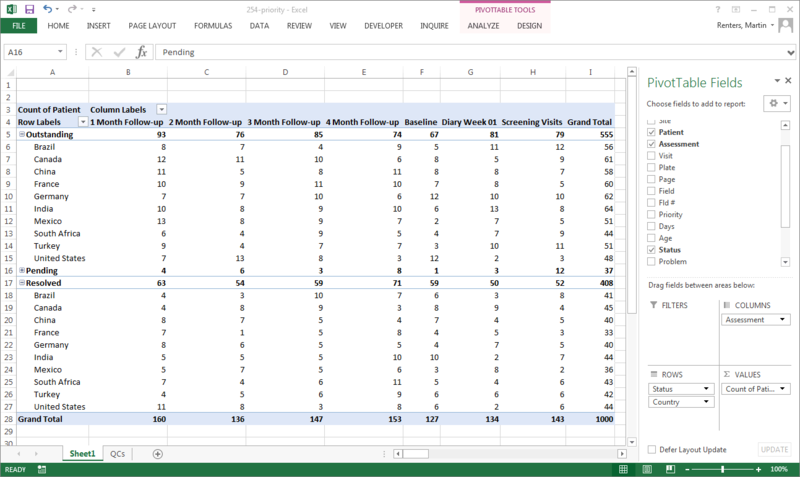 The data sets that QC2Excel generates can be analyzed using Excel’s Pivot Table functionality. For example, a pivot table can be created in a few seconds that counts the number of QCs grouped by status, country and visit number. 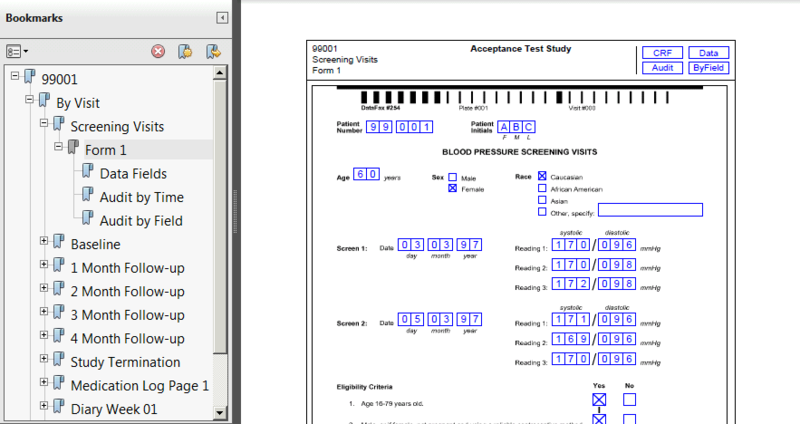 The AnnotateCRF tool creates beautifully annotated CRFs from a DataFax study. 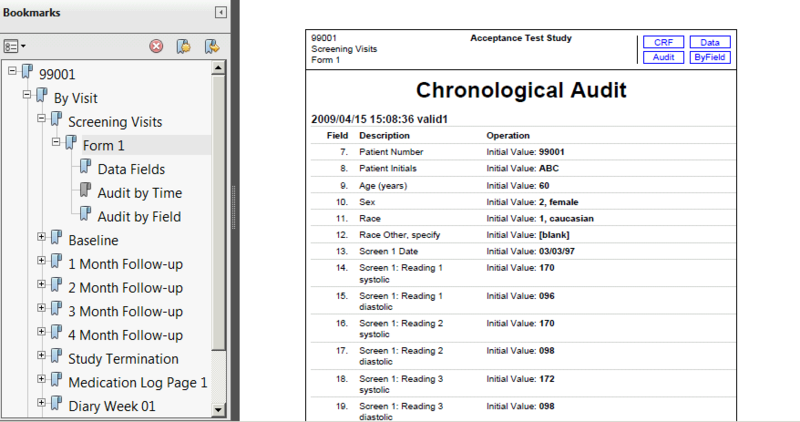 The left hand side of each output page shows the CRF image and the right hand side shows its name, alias, type description, format, coding and legal range or edit checks. Fields can be color coded by priority as with QC2Excel and hyperlinks allow easy navigation through the document. 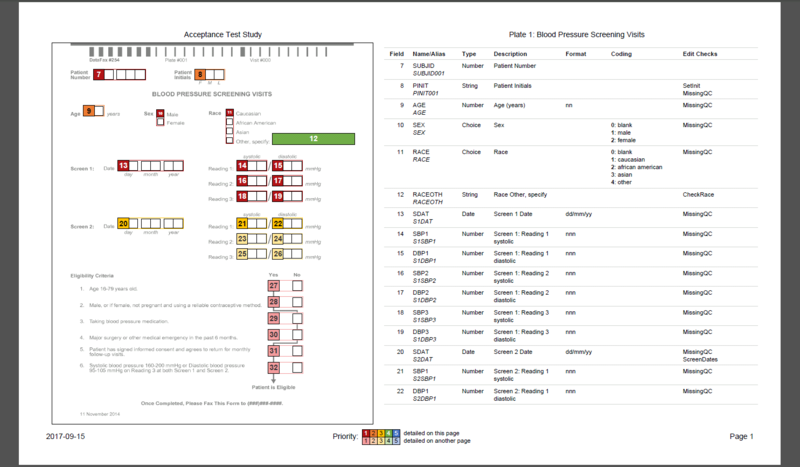 The closeout PDF generator creates PDFs of patient records that meet the FDA’s margin and font size requirements. The output files are hyperlinked for easy navigation, are searchable and are designed to be easy to read. 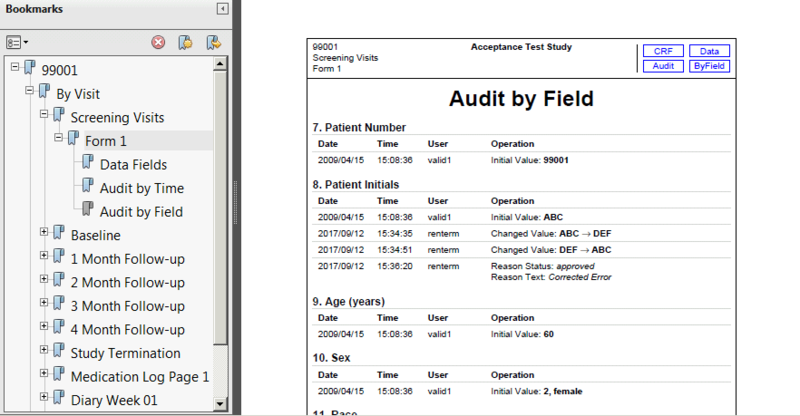 Each patient record is presented as a CRF image with the data fields overlaid followed by a data listing of each field and its value. 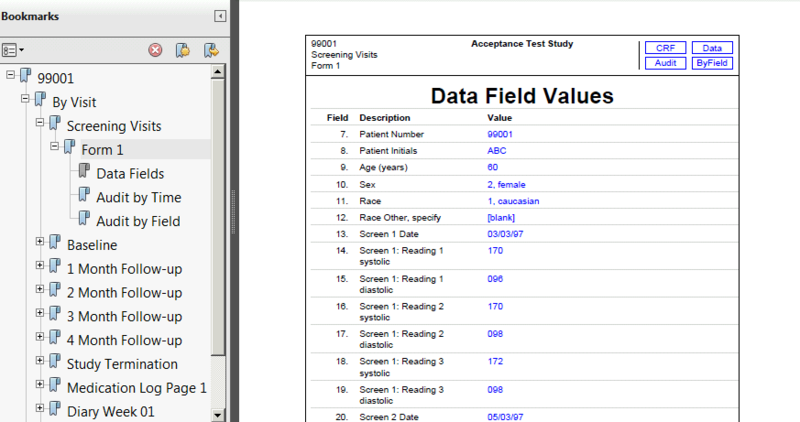 This ensures that fields that are too long to be shown on the CRF view can still be read in their entirety. Audit trail information is also included, both as chronological format and in a field by field format that allows the field history to easily be seen at a glance. Bookmarks and hyperlinks are naturally also included. The Sigtrack program tracks the status of electronic signatures over time and determines whether data changes were made since the signature was executed. If data changes are found, they are reported and the record is marked as requiring re-signing. Signatures can span multiple pages and multiple signatures per page are also supported. This program can also be used for source data verification (SDV) tracking. An Excel file is produced that shows the state of all signatures (never signed, signature valid, signature invalidated) along with any data fields that have changed since signing. In addition, a DataFax DRF file is produced with the keys of records that need to be re-signed. These tools were developed under contract with the Population Health Research Institute (PHRI) and they have graciously agreed to release them as open-source software for the benefit of the DataFax community. The source code can be found on the DFtoolkit page on GitHub. teckelworks provides installation assistance and training for these tools. Additional feature development and/or customization is also available. Please contact us to discuss your requirements or for edit check and custom DataFax report development.